If all you are required to bring to your hosts’ house for Thanksgiving this year is a salad to add to the menu, consider preparing one of these beautiful versions that celebrate the most amazing flavors fall has to offer. One serves as a hearty first-course salad; the other a nice palate-cleanser. Remember this great vinaigrette video? It certainly comes in handy for these salads! *Be sure to hit the blue links to see the helpful videos we’ve made to guide you through the recipe. As always, subscribe to our YouTube channel! Cook the bacon: In a medium skillet over medium flame, cook the bacon until crispy. Transfer the bacon to a plate lined with paper towels and set aside. Make the vinaigrette: Pour as much of the bacon grease into a clean glass measuring cup and add additional olive oil to make up ¾ cup. Set aside. In a small bowl, whisk together the mustard, shallot, vinegar and thyme. Add a pinch of kosher salt and freshly ground black pepper. Pour the oil mixture in a thin, steady stream as you whisk the vinegar mixture together. Alternatively, you can add all of the ingredients into a jar and shake vigorously. Assemble the salad: In a large bowl, toss together the bacon, diced apple, walnuts, dried cranberries and spinach with a drizzle of the vinaigrette. Taste and season with salt and pepper. Divide the salad evenly among the serving plates and top with the bleu cheese. Make the vinaigrette: In a mixing bowl, combine the vinegar, mustard, shallot, thyme and salt and pepper. Mix together until smooth. In a slow, steady stream, pour in the oils while whisking constantly until the vinaigrette is thickened. Set aside. In a large mixing bowl, combine the frisee, orange segments and half the pomegranate seeds. Toss with ¼ cup of the dressing and salt and pepper. Evenly divide the salad among the serving plates and top with the remaining pomegranate seeds and the hazelnuts. There is so much going on it might look like it’s got everything but the kitchen sink; but break that down and examine what it’s offering: soft, sweet greens… a meaty tuna steak (pure protein)… ripe cherry tomatoes (nature’s candy, at the peak of their season, it’s a little red garden kiss)… crunchy green beans… soft, satisfying potatoes that soak up the vinaigrette… vinegary fruity olives… creamy hard-cooked eggs… all pulled together with a vinaigrette made with the best olive oil you can afford. This is the Salad of all salads, folks. It’s the best of everything — all on one plate. 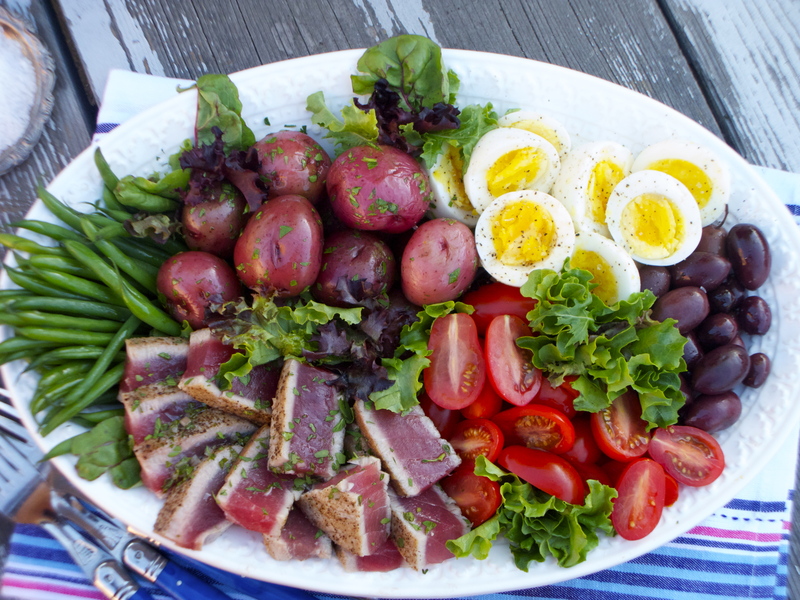 At the risk of making you think I’ve gone over the deep end, I believe Aristotle might have had the Nicoise Salad in mind when he said, “the whole is greater than the sum of its parts.” It’s a marriage of the best quality ingredients and execution of technique. If ever you wanted to improve your cooking skills, make this salad a few times this month. Each component for this salad requires a technique. The better you are at mastering each technique, the more amazing this salad becomes. And the best part of using this salad to practice your skills: you get to eat your efforts! Rip open a crusty baguette and open a bottle of wine (a dry rosé would be perfect, by the way). Think of us when you do. Cheers! Place a large serving dish or platter in your fridge to chill. Make a batch of vinaigrette and set aside. Prepare the salad greens keep covered in the fridge with a damp paper towel. Make the hard-cooked eggs. Peel and chill them. Trim and blanch the haricots vert. Drain from the ice bath and keep chilled. Boil the potatoes and toss in a separate bowl with salt, pepper and 2 tablespoons of vinaigrette. Set aside. Halve the cherry tomatoes and set aside. To sear the tuna, heat a stainless steel pan over high flame. As the pan is heating, generously season both sides of the tuna with salt and pepper. The pan will be heated properly when water beads as it’s sprinkled into the pan. Let the water evaporate from the pan before adding the oil. Drizzle in 2 tablespoons of grapeseed oil and place the tuna on the pan to sear one side for 45 seconds. Carefully lift the tuna and flip to the other side and sear for another 45 seconds on the other side. Immediately remove the tuna from the pan onto a plate and tent with foil for 10 minutes. in this composition, the sliced tuna steak will take center stage. The rest of the components will surround the tuna around the edges of the platter. Use the same bowl to toss each separate component with vinaigrette. Lightly toss the salad greens with salt, pepper and vinaigrette and arrange on the platter. Peel the hard-cooked eggs. Cut them in half and sprinkle with salt and pepper. Lightly drizzle with a teaspoon of vinaigrette. Arrange them on the platter. Cut the potatoes in half and toss with more vinaigrette. Arrange them on the platter. Toss the haricots vert with salt, pepper and vinaigrette. Arrange them on the platter. Toss the cherry tomatoes with vinaigrette and arrange them on the platter. Arrange the olives on the platter. Slice the tuna in ¼-inch slices across the grain and arrange in the center of the platter. Drizzle some more vinaigrette over the top of the salad and sprinkle with freshly ground black pepper. C. Vinaigrette for Nicoise Salad — ah yes, remember this one? Add all of the ingredients into a clean jar (preferably one that is 12 – 16 ounces in capacity). Make sure the lid is on tight and shake to combine. Keep in the fridge until you are ready to use. Every cook should be able to make a vinaigrette in his or her sleep. Why? It’s a versatile sauce that can be used on salad and veggies, works equally well on cold meat and fish dishes, and can even substitute for a marinade. It’s a sauce that is quick and easy to make and stores well in the fridge for up to two weeks. Vinaigrette is also the sauce where you can let your creativity run wild with the possibility of dozens (hundreds) of variations once you understand the basics. In a small bowl, whisk together the shallot, herbs, mustard, salt and pepper with the vinegar until smooth. Continue to whisk while slowly pouring in a thin, steady stream, the olive oil. The mixture will gradually thicken. Helps to keep the emulsion from separating. A little goes a long way. Fresh herbs are the stars of vinaigrette. It’s what sets a homemade vinaigrette apart from the store bought stuff!